ADF v2 public preview was announced at Microsoft Ignite on Sep 25, 2017. With ADF v2, we added flexibility to ADF app model and enabled control flow constructs that now facilitates looping, branching, conditional constructs, on-demand executions and flexible scheduling in various programmatic interfaces like Python, .Net, Powershell, REST APIs, ARM templates. One of the consistent pieces of customer feedback we received, is to enable a rich interactive visual authoring and monitoring experience allowing users to create, configure, test, deploy and monitor data integration pipelines without any friction. We listened to your feedback and are happy to announce the release of visual tools for ADF v2. The main goal of the ADF visual tools is to allow you to be productive with ADF by getting pipelines up & running quickly without requiring to write a single line of code. You can use a simple and intuitive code free interface to drag and drop activities on a pipeline canvas, perform test runs, debug iteratively, deploy & monitor your pipeline runs. With this release, we are also providing guided tours on how to use the enabled visual authoring & monitoring features and also an ability to give us valuable feedback. Our goal with visual tools for ADF v2 is to increase productivity and efficiency for both new and advanced users with intuitive experiences. 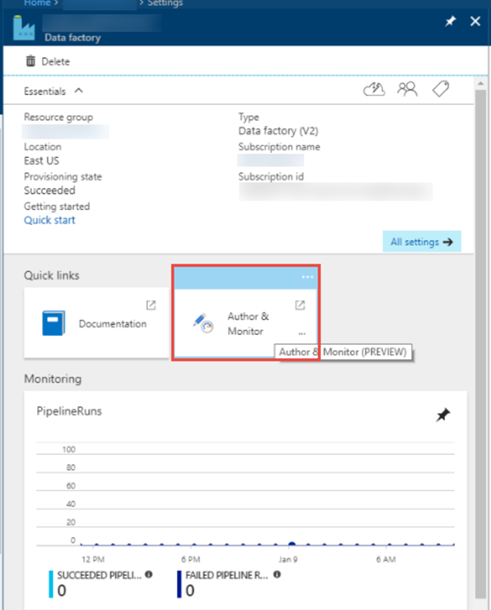 You can get started by clicking the Author & Monitor tile in your provisioned v2 data factory blade. Support for 65 data stores. 18 stores with first class support that require users to provide just configuration values. The remaining 47 stores can be used with JSON. Click on the Feedback icon to give us feedback on various features or any issues that you may be facing. Hover on the Data Factory icon on the top left. Click on the Arrow icon to see a list of Azure subscriptions and data factories that you can monitor. Monitor pipeline, activity & trigger runs with a simple list view interface. All the runs are displayed in local browser time zone. You can change the time zone and all the date time fields will snap to the selected time zone. Right click the list view header and choose columns that you want to appear in the list view.